Statement of Problem: Over 30% of the world population suffers from edentulism. Implant supported overdenture have been a relatively successful treatment option for edentulism and have shown to slowed the rate of residual resorption and maintain the vertical height of the residual. Purpose: The purpose of this study was to measure patient masticatary efficiency and satisfaction with the mandibular one-, two-, and three-implant-retained overdenture therapy when compared with conventional denture in a the same patients. Materials and Methods: Ten complete edentulous patients, who were wearing conventional complete dentures, were involved in this study. Three single piece endosseous implant of 3.0 mm in diameter and 13 mm in length were surgically placed in the mandible in the region of B, C, and D. Mandibular denture was connected for single, two, and three implant supported overdenture periodically and checked for masticatory efficiency using a bite gauge and patient satisfaction using a questionnaire. Results: Statistical analysis was done using Wilcoxon signed rank test. Four groups of bite forces when compared to each other. Group 1 was compared with Group 2, with the statistical value showing significance. Signed rank test showed no significance (0.268) when Group 2 was compared with Group 3. When Group 3 was compared with Group 4, and Group 1 compared with Group 4, rank test showed significant values. Four groups were compared with each other for patient satisfaction, Group 1 was compared with Group 2, with the statistical value showing no significance. Conclusions: A single midline implant supported overdenture can be considered as a suitable and cost-effective treatment option over conventional denture. The study concludes that masticatory efficiency of this single midline implant supported overdenture is better than the conventional complete denture. Edentulism is considered as handicap for the elderly patients, and over 30% of the world population suffers from this condition. India has a large geriatric population (60+ years) of 77 million, comprising 7.7% of its total population. Edentulism affects the underlying nutritional deficiency, as the patient is not able to chew and digest his food properly. These patients may also suffer from a range of age-related diseases, which may be further worsened by the patient's edentulism and thus effecting the quality of life. Tooth supported overdentures have been relatively successful treatment option for edentulism, and retaining the roots have shown to have slowed the rate of residual resorption due to proprioception. A successful treatment option could be placing implants in the edentulous jaw and connecting it to the denture through an attachment similar to tooth supported overdenture. , This treatment option provides greater clinical benefits and patient satisfaction than a conventional denture and can significantly improve patient's quality of life. Comparative evaluation of the masticatory efficiency and patient satisfaction in patients with single implant support and two-implant supported is not documented. Hence, a clinical study was planned with a research hypothesis, to compare the masticatory efficiency and patient satisfaction of conventional complete denture, when compared with single, two, and three implant supported dentures, respectively, in the same patient over a period of time. Ten maxillary and mandibular edentulous patients, treated with a set of maxillary and mandibular conventional complete dentures, for more than 6 months, were considered for this study. These patients were explained with complete treatment protocol, and an informed consent form was signed from these patients. Masticatory load generated through the conventional dentures was recorded in all these patients using the specially designed bite gauge. Satisfaction with its function, esthetics was assessed based on a questionnaire supplied to the patients. Three single piece endosseous implant of 3.0 mm in diameter and 13 mm in length (Snap, Eqvinox Pvt. Ltd., India) were surgically placed in the mandible in the region of B, C, and D, after reflecting the anesthetized mucosa [Figure 1]. Parellelism and equi-distance of the implants in between each other was maintained with a prefabricated surgical stent for the initial drill. The reflected mucosa was sutured back and analgesics were prescribed, and the patient was advised not to wear the denture for a week to allow soft tissue healing. After a week, the existing denture was relieved in the tissue surface area of the denture to accommodate the projections of the single pieces implants and rechecked intraorally with occlusal spray (Okklean, DFS, Landenstrabe, Reidenburg, Germany). Patient was asked to use the conventional denture limitedly for 3 months of healing face. After 3 months of healing, the implants were loaded sequentially over a period of time. In stage 1, the single midline implant (C position) was the first to be loaded by engaging the dolla bona head of the single piece implant with that of the female component in the denture. The other two implants (B and D position) were not engaged. After a month time from the time of loading, the patient was evaluated for his masticatory efficiency using the bite gauge and patient satisfaction by the questionnaire. In stage 2 of the study, the implants in B and D positions were engaged with a denture, after disengaging the implant in position C and making sure that there is no contact of the denture and implant of position C. Thus, in stage 2, it was two implant supported overdenture [Figure 2]. Again, after 1 month of implant loading in this situation, the masticatory recording and patient satisfaction was recorded as previously did for in stage 1. In stage 3 of the study, the implant in the position C was again connected and thus making it three implant supported overdenture. One month of loading the three implant supported overdenture, similar recording of the masticatory efficiency and patient satisfaction was recorded (Annexure I)[Additional file 1]. The bite gauge used was based on the principles of the strain gauge to measure the bite force (ASEC Solutions, Bengaluru, India). It consists of a processing unit with an instrument panel and sensor. The force exerted was measured in Newton. Group 4: Bite force values of the individual with conventional dentures supported by all the three implants (B, C, and D position). The descriptive analysis was done to evaluate the mean value and standard deviation of the masticatory efficiency generated from a conventional denture, single, two, and three implant supported overdenture. Statistical analysis was done using Wilcoxon signed rank test. Four groups of bite forces when compared to each other. Group 1 was compared with Group 2, with the statistical value showing significance [Table 1]. Signed rank test showed no significance (0.268) when Group 2 was compared with Group 3 [Table 1]. When Group 3 was compared with Group 4, and Group 1 compared with Group 4, the rank test showed significant values [Table 1]. Similarly for patient satisfaction, statistical analysis was done using Wilcoxon signed rank test. Four groups were compared with each other for patient satisfaction, Group 1 was compared with Group 2, with the statistical value showing no significance [Table 2]. Signed rank test showed significance (0.026) when Group 2 was compared with Group 3 [Table 2]. When Group 3 was compared with Group 4, and Group 1 compared with Group 4, the rank test showed significant values [Table 2]. The improvement in the quality of life of the edentulous individual has been the mainstay for the recommendation of this implant-supported overdenture. ,, After rehabilitation with the implant-supported overdenture an improvement in the quality of life, food selection, and nutrition had been observed in the past. , The patients were highly satisfied with the implant-supported overdenture due to the comfort and the fit of the denture. The findings of this present study showed that the patients rated the implant-supported overdenture to be more comfortable than their previous conventional dentures. The statistical evaluation showed that there was no significant difference in patient satisfaction when conventional denture was compared with that single implant supported denture, even though the masticatory efficiency showed significance. The patients opinioned that their ability to chew food was improved after implant placement and that the three implant supported situation was the most comfortable. Though according to the literature, the least number of implants to be used in a mandibular overdenture is two. Recent studies challenge this fact that a minimum of two implants must be used, with the use of a single midline implant. In this study, it was observed that the masticatory efficiency of single implant when compared with two implants was significant, which indicates that patient did find much difference with one and two implant-supported overdenture. The single midline implant in the mandibular symphyseal region followed by a suitable attachment type incorporated in the mandibular denture have been compared to the two implant supported overdenture and have been reported to be as efficient and more cost effective. In the previous studies, the single and two implants were randomly placed in different patients, whereas in this study, all the implants were placed in the same individual so that he/she could differentiate between the situations. The results in the present study suggest that the single implant supported overdenture was as efficient as that of two implant supported overdenture in relation to bite force under the given conditions. The patients were satisfied with the implant-supported overdenture and rated the three implant-supported overdenture to be the most stable. The single implant supported overdenture, however, showed an increase in bite force and some patients were comfortable with the single implant-supported overdenture. However, more prospective studies are required to validate the finding that a single implant retained overdenture can be used as a suitable cost-effective treatment alternative for the severely debilitated edentulous individual. This finding can be used to modify the McGill consensus and state that a single mandibular midline supported implant will suffice the treatment of an edentulous mandible. This finding would especially benefit the economically weakened section of the population in the developing nations and other third world countries. Within the limitations of this study, it was concluded that a single midline implant supported overdenture can be considered as a suitable and cost-effective treatment option over conventional denture. The study concludes that masticatory efficiency of this single midline implant supported overdenture is better than the conventional complete denture. The three implant supported overdenture was the best among the three situations compared in this study. The two implant supported overdenture can be further made efficient by placing a single midline implant and making it three implant supported. Mericske-Stern RD, Taylor TD, Belser U. Management of the edentulous patient. Clin Oral Implants Res 2000;11 Suppl 1:108-25. Shah N, Parkash H, Sunderam KR. Edentulousness, denture wear and denture needs of Indian elderly - A community-based study. J Oral Rehabil 2004;31:467-76. Hutton B, Feine J, Morais J. Is there an association between edentulism and nutritional state? J Can Dent Assoc 2002;68:182-7. Chen L, Xie Q, Feng H, Lin Y, Li J. The masticatory efficiency of mandibular implant-supported overdentures as compared with tooth-supported overdentures and complete dentures. J Oral Implantol 2002;28:238-43. Ando T, Maeda Y, Wada M, Gonda T. Measuring the load-bearing ratio between mucosa and abutments beneath implant- and tooth-supported overdentures: An in vivo preliminary study. Int J Prosthodont 2011;24:43-5. Thomason JM, Kelly SA, Bendkowski A, Ellis JS. Two implant retained overdentures - A review of the literature supporting the McGill and York consensus statements. J Dent 2012;40:22-34. Thomason JM. The McGill consensus statement on overdentures. Mandibular 2-implant overdentures as first choice standard of care for edentulous patients. Eur J Prosthodont Restor Dent 2002;10:95-6. Feine JS, Carlsson GE, Awad MA, Chehade A, Duncan WJ, Gizani S, et al. The McGill consensus statement on overdentures. Quintessence Int 2003;34:78-9. Thomason JM, Feine J, Exley C, Moynihan P, Müller F, Naert I, et al. Mandibular two implant-supported overdentures as the first choice standard of care for edentulous patients - The York consensus statement. Br Dent J 2009;207:185-6. Cheng T, Sun G, Huo J, He X, Wang Y, Ren YF. 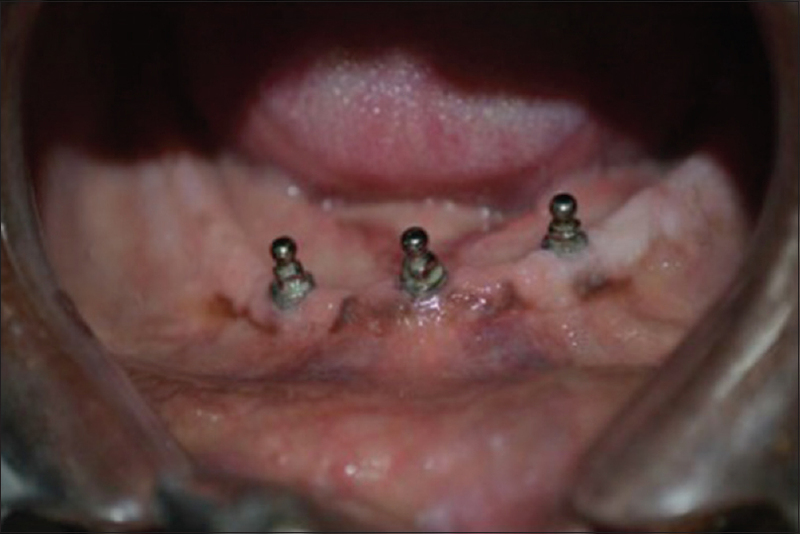 Patient satisfaction and masticatory efficiency of single implant-retained mandibular overdentures using the stud and magnetic attachments. J Dent 2012;40:1018-23. Harder S, Wolfart S, Egert C, Kern M. Three-year clinical outcome of single implant-retained mandibular overdentures - Results of preliminary prospective study. J Dent 2011;39:656-61. Geertman ME, Boerrigter EM, van Waas MA, van Oort RP. Clinical aspects of a multicenter clinical trial of implant-retained mandibular overdentures in patients with severely resorbed mandibles. J Prosthet Dent 1996;75:194-204. Närhi TO, Geertman ME, Hevinga M, Abdo H, Kalk W. Changes in the edentulous maxilla in persons wearing implant-retained mandibular overdentures. J Prosthet Dent 2000;84:43-9. Thomason JM, Lund JP, Chehade A, Feine JS. Patient satisfaction with mandibular implant overdentures and conventional dentures 6 months after delivery. Int J Prosthodont 2003;16:467-73. Kordatzis K, Wright PS, Meijer HJ. Posterior mandibular residual ridge resorption in patients with conventional dentures and implant overdentures. Int J Oral Maxillofac Implants 2003;18:447-52. Kimoto K, Garrett NR. Effect of mandibular ridge height on masticatory performance with mandibular conventional and implant-assisted overdentures. Int J Oral Maxillofac Implants 2003;18:523-30. Palmqvist S, Owall B, Schou S. A prospective randomized clinical study comparing implant-supported fixed prostheses and overdentures in the edentulous mandible: Prosthodontic production time and costs. Int J Prosthodont 2004;17:231-5. Fueki K, Kimoto K, Ogawa T, Garrett NR. Effect of implant-supported or retained dentures on masticatory performance: A systematic review. J Prosthet Dent 2007;98:470-7. Walton JN, Glick N, Macentee MI. A randomized clinical trial comparing patient satisfaction and prosthetic outcomes with mandibular overdentures retained by one or two implants. Int J Prosthodont 2009;22:331-9. Stellingsma K, Slagter AP, Stegenga B, Raghoebar GM, Meijer HJ. Masticatory function in patients with an extremely resorbed mandible restored with mandibular implant-retained overdentures: Comparison of three types of treatment protocols. J Oral Rehabil 2005;32:403-10. Kuoppala R, Näpänkangas R, Raustia A. Quality of life of patients treated with implant-supported mandibular overdentures evaluated with the oral health impact profile (OHIP-14): A survey of 58 patients. J Oral Maxillofac Res 2013;4:e4. Cakir O, Kazancioglu HO, Celik G, Deger S, Ak G. Evaluation of the efficacy of mandibular conventional and implant prostheses in a group of Turkish patients: A quality of life study. J Prosthodont 2014;23:390-6. Hamdan NM, Gray-Donald K, Awad MA, Johnson-Down L, Wollin S, Feine JS. Do implant overdentures improve dietary intake? A randomized clinical trial. J Dent Res 2013;92 12 Suppl: 146S-53S. Kronstrom M, Davis B, Loney R, Gerrow J, Hollender L. A prospective randomized study on the immediate loading of mandibular overdentures supported by one or two implants: A 12-month follow-up report. Int J Oral Maxillofac Implants 2010;25:181-8. Alsabeeha NH, Swain MV, Payne AG. Clinical performance and material properties of single-implant overdenture attachment systems. Int J Prosthodont 2011;24:247-54.